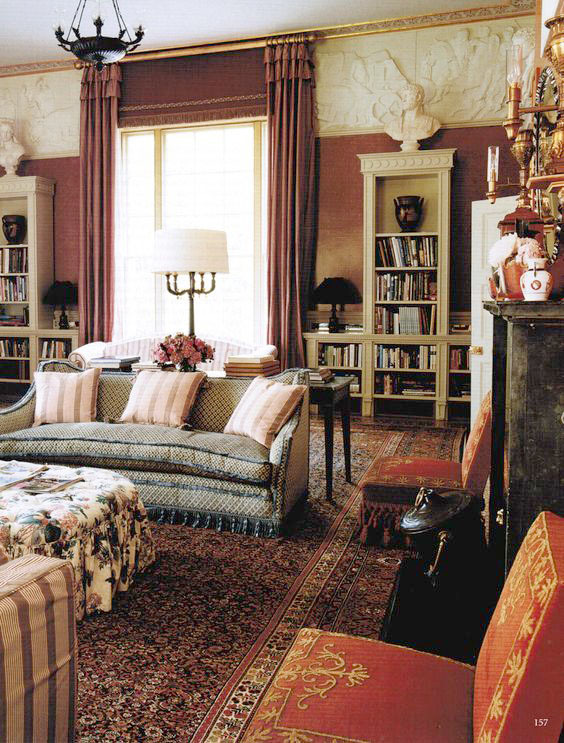 One of my all time favourite rooms is the drawing room at Hambleden Manor. If you missed my raving about it (and my sadness about its recent demise) read about it here . 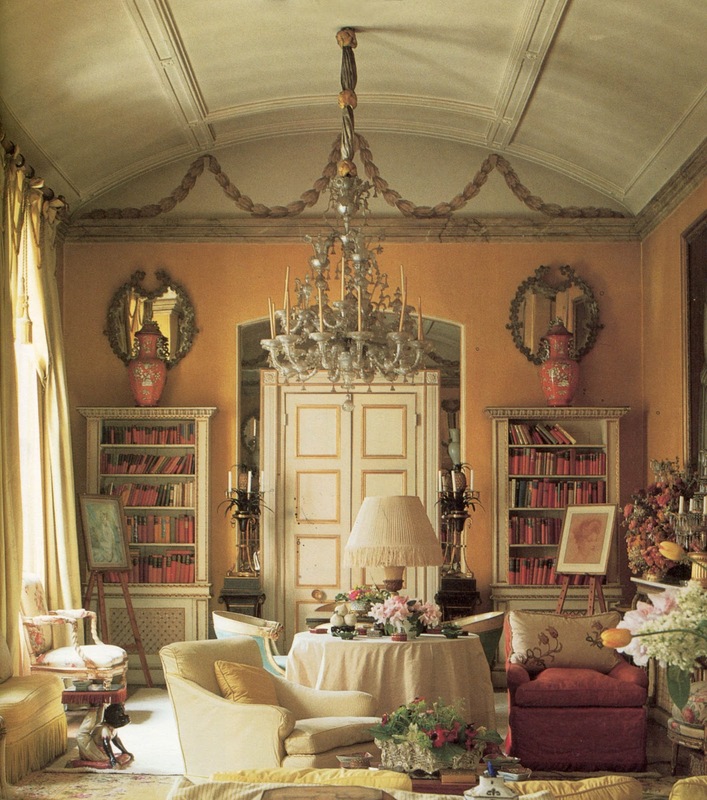 It is just a wonderfully warm and smart symphony of colours and comfort, created by John Fowler and Lady Hambleden. sock; the fabric wrapping around the chain that the chandelier hangs from the ceiling with. I have no idea if there is a more common name for these bits of fabric but I have always called them that. 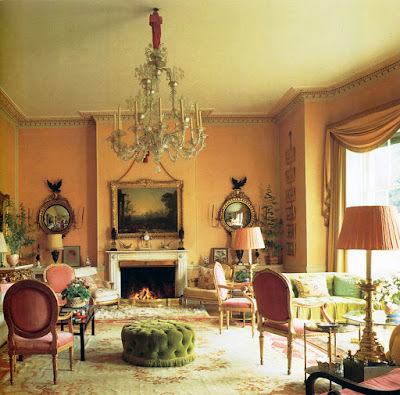 They were a common feature in rooms that John Fowler had had a hand in; another famous example is Nancy Lancaster's yellow drawing room in London, now part of the Colefax & Fowler head office. Recently I talked about these fabric socks with a friend and he put them down as '...rather 60s and decoratorey' , which was clearly not a good thing. I suppose this was the legacy of John Fowler speaking and the many imitators of his style. Chandelier socks were lumped together with those wide ribbons and bows that pictures were hung from in the 80s (more about them perhaps in another post). However, when I looked through my images I found examples throughout the 19th century; chandelier socks were everywhere, EXCEPT .... in England. So where Britain is concerned my friend may well have been right (with 1 exception which I will show), but in the rest of Europe they were widely used from the age of Napoleon onwards. 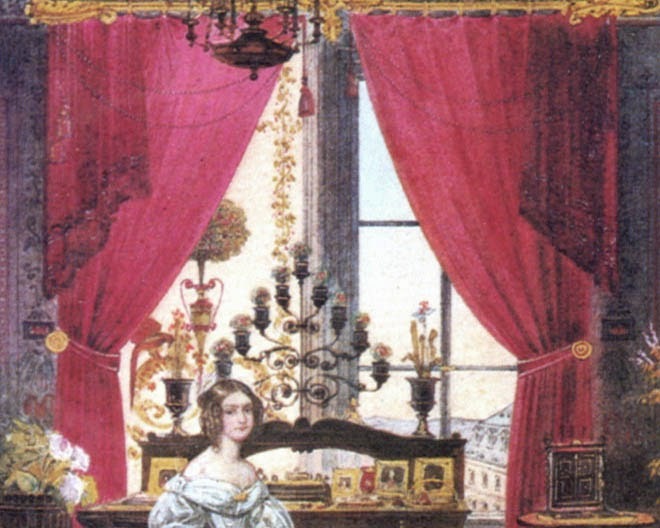 The earliest I have found dates from 1810, and it depicts, in fact, one of Napoleon's sisters, Caroline Murat, in a room at the Elysee palace in Paris, two years after he made her husband King of Naples. 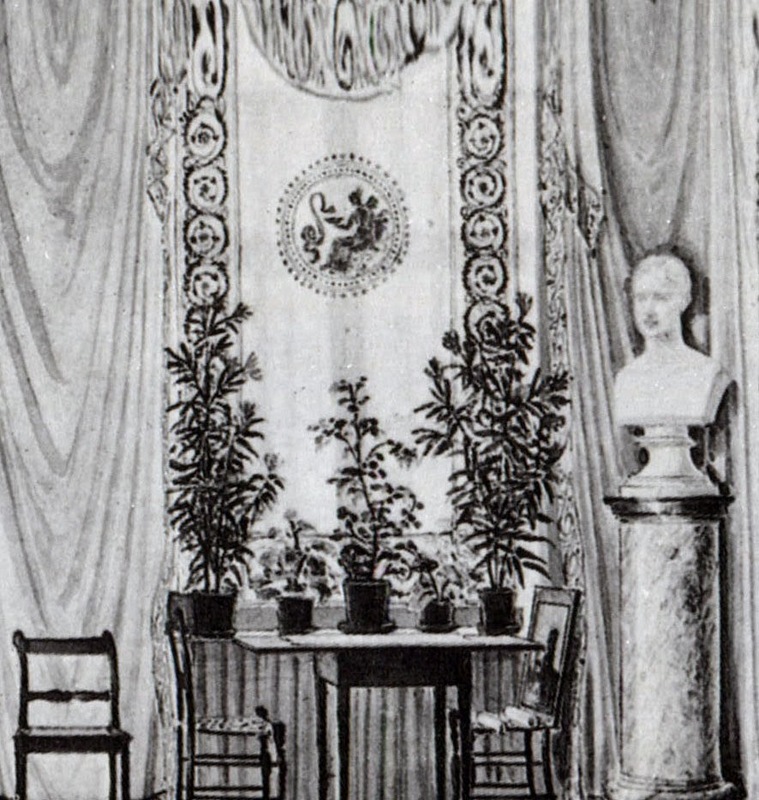 This was the 'Silver Salon' on the ground floor of what is now the Presidential Palace, with terrribly smart silvered furniture that was upholstered in red taffeta and embroidered with silver. The chandelier sock is clearly conceived as part of this scheme. Only one year later her drawing room in Naples was depicted with a chandelier chain covered in cream fabric and gold fringe, much like the rest of the room. This image shows what I love so much about these artistic interior views. 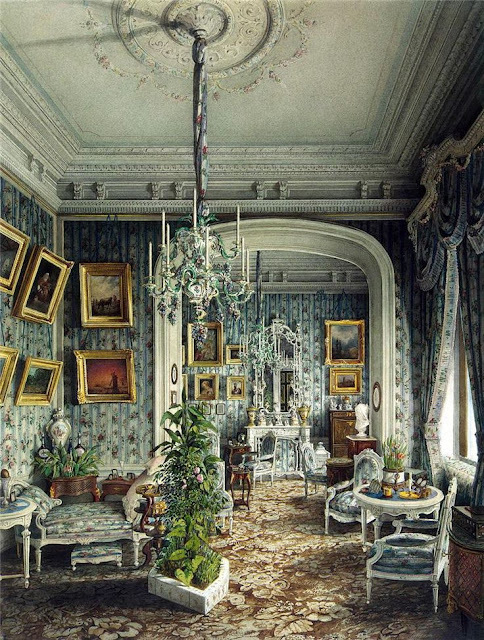 Not only do they offer an astonishing amount of historical detail, but they also depict rooms in a way that photography could never have done. 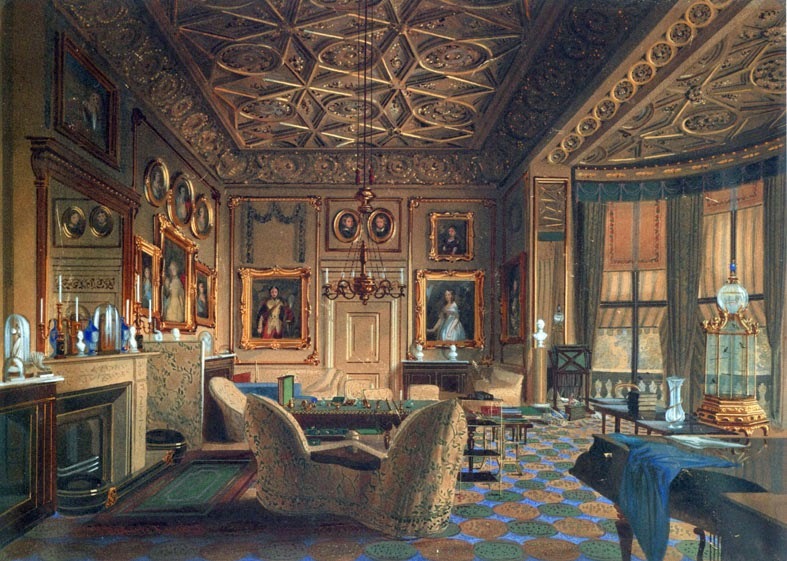 Looking at the ceiling and the carpet you realize that we see the entire room, not just one end of a room that was actually much longer. 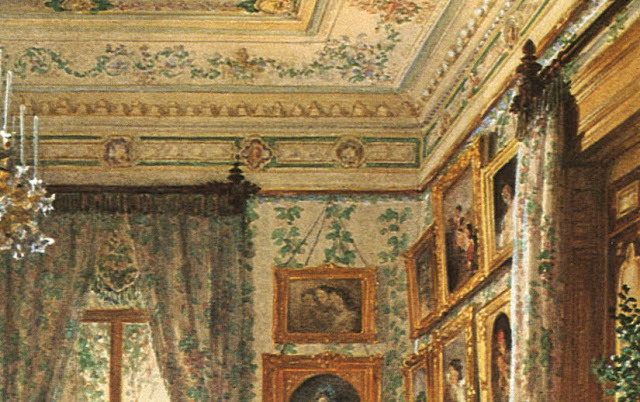 To replicate this image on film, you would have to remove one entire side of the room ! It's like a stage set, and this particular perspective has never actually existed. So from around this time these chandelier chains wrapped in fabric become common in images from France, Italy, Germany and Russia. Right from the beginning they seem to have been part of the decorative scheme. 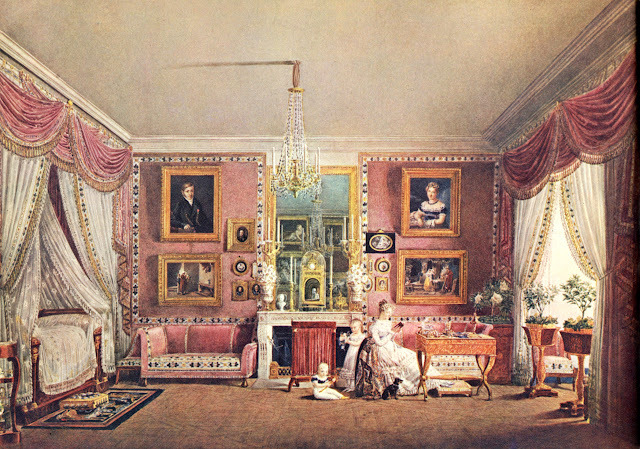 Palatial interiors tended to be very colour coordinated and I have found only one or two images where the fabric used for the chandelier is NOT in the dominant colour of the room. 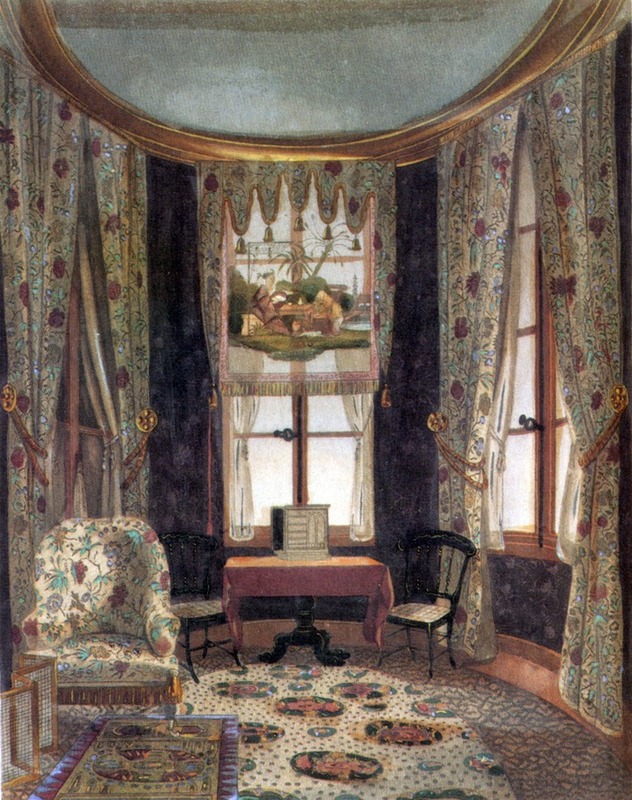 In the 1820s this lovely private room in the Royal Palace in Munich, had gorgeous wall paper, an interesting glazed door and a chandelier sock that matched the curtain pelmets. 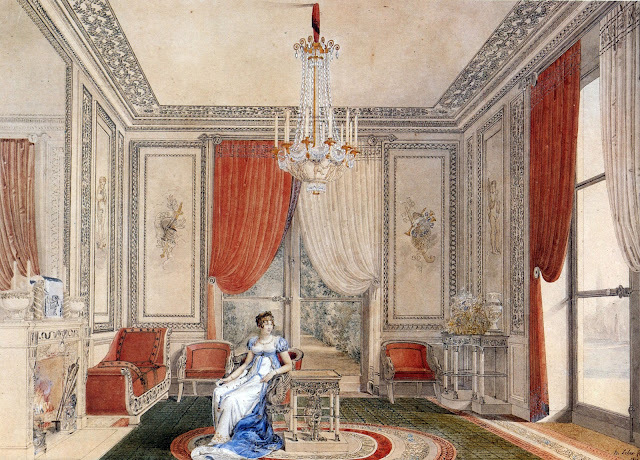 Another beautiful room where absolutely everything matched and coordinated, was in one of the outer pavilions of Tuileries Palace, and it depicts the Duchess de Berry with her son in 1822. 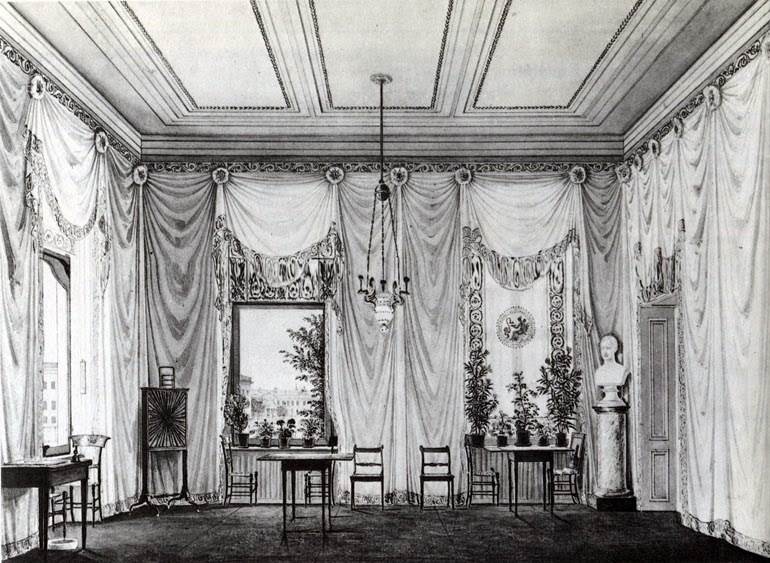 The upholstery used many meters of braid, but the chandelier sock was quite simple and probably in the same fabric as the walls and the curtains. 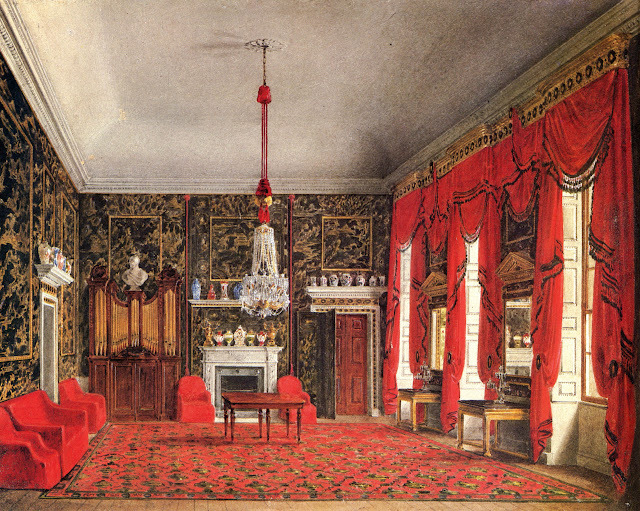 It is at Cassiobury Park and the fabric matches the room. 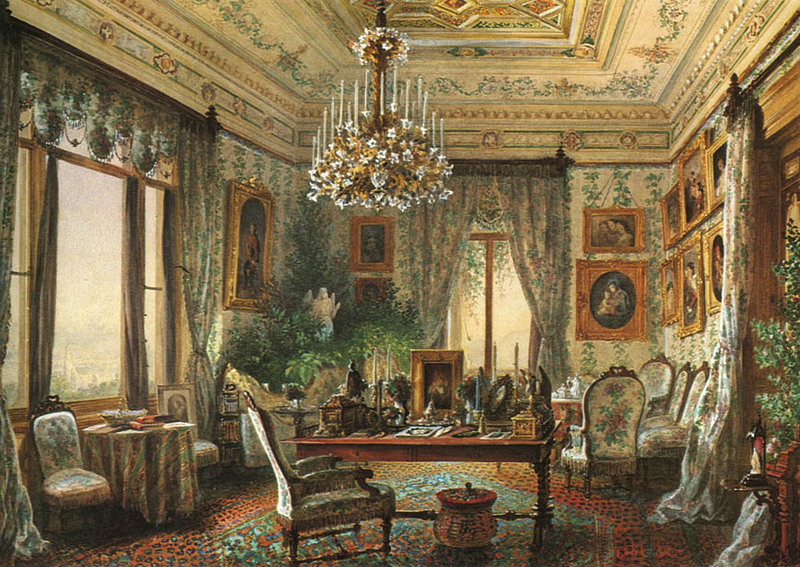 I particularly love the painted ceiling and the illusion of an open sky where a large bird is flying around, conveniently carrying a chandelier. 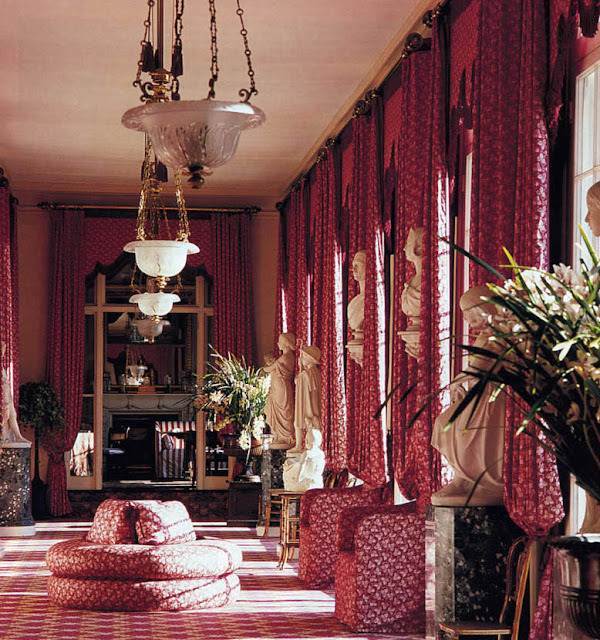 It reminds me of one of the rooms in the Royal Pavillion in Brighton, built for the Prince Regent (later King George IV). There a giant Chinese dragon flies through the sky carrying the chandelier. I still remember being mesmerised by this idea when I saw it aged 14. The Prince Regent loved everything french and his interiors are of an unimaginable opulence EXCEPT ... for the chandelier chains. One almost suspects he had a personal dislike for them. At the time that in Paris they were clearly used in the smartest interiors, his excessively upholstered rooms had chandeliers with uncovered chains. 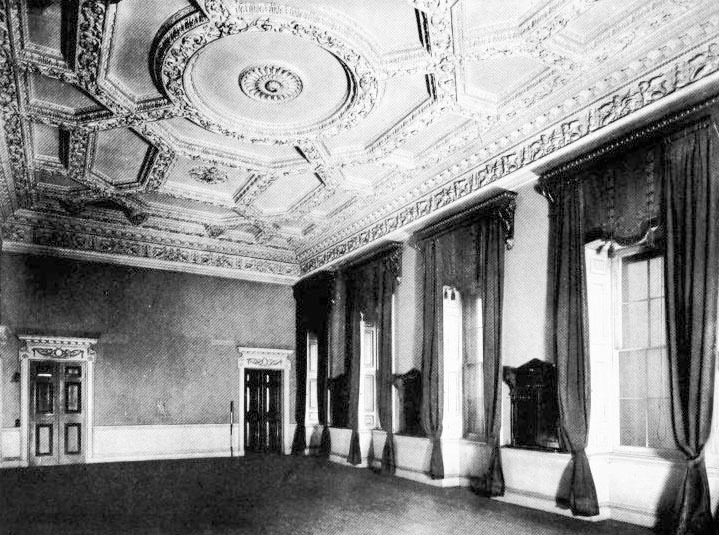 In 1820 the Rose Satin Room was entirely hung with ... well, rose satin, which must have looked incredible, but was there no little bit left over to cover the chandelier chain with ? This was in Carlton House Palace and the amount of fabric used for these rooms is completely over the top, and yet in none of them the chandelier chain has a fabric cover. 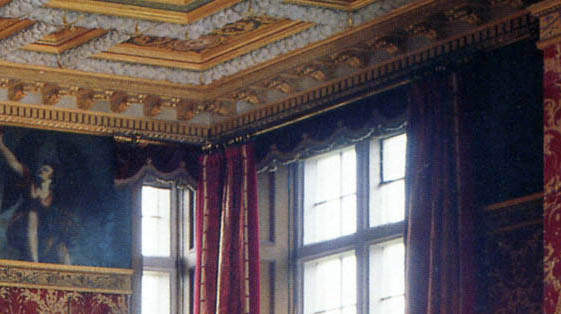 What you do sometimes see in English rooms is a chandelier hung from ropes and tassles; Here, in Buckingham house (later the Palace) this is made in the same colour as the rather splendid curtains. 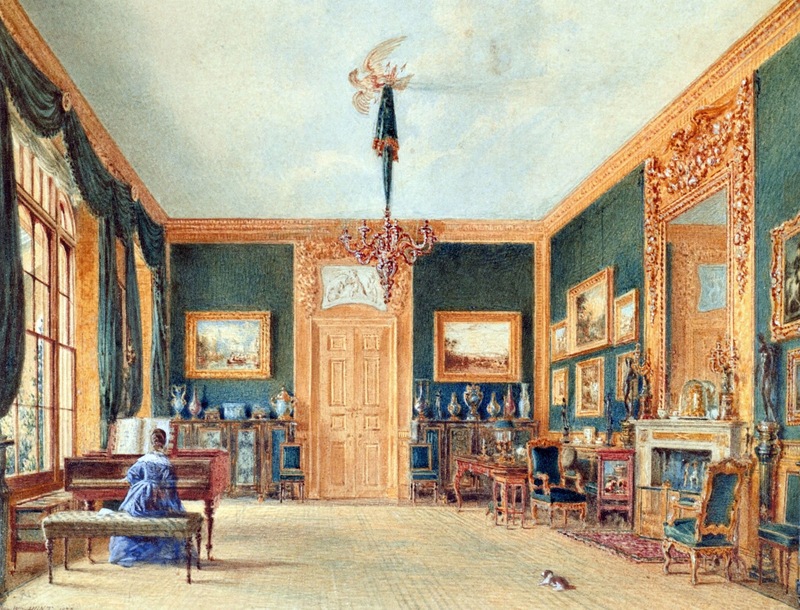 Perhaps this was a pully system that allowed for the chandelier to come down and this may explain the lack of fabric socks: perhaps in Britain they used to lower the chandeliers in a different way, which meant that the fabric was impractical ...? 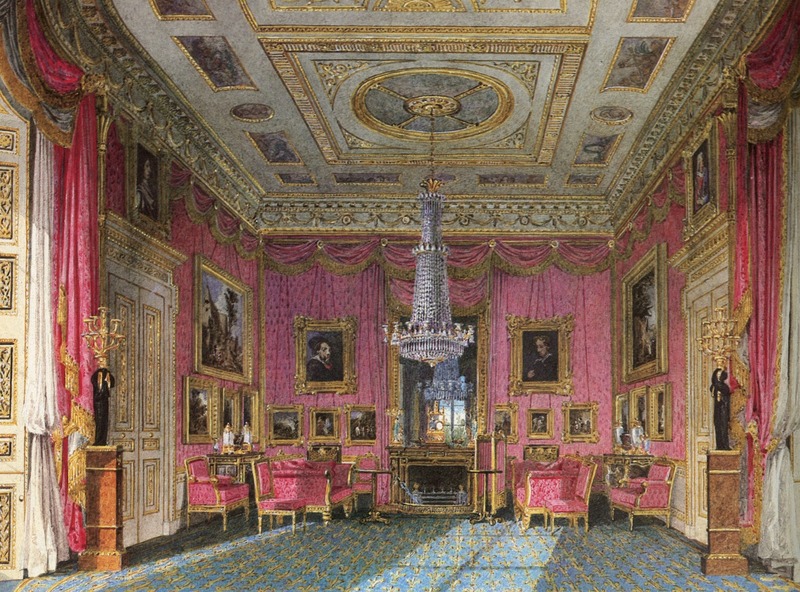 Even so, there are many images of opulent interiors, throughout the 19th century where you think "If this had been the continent there would have been fabric around that chain". So, back to the continent and on to those marvelous images of the Winter Palace that the Imperial family commissioned all through the century. The detail of these views are incredible and I wish I could show them all. 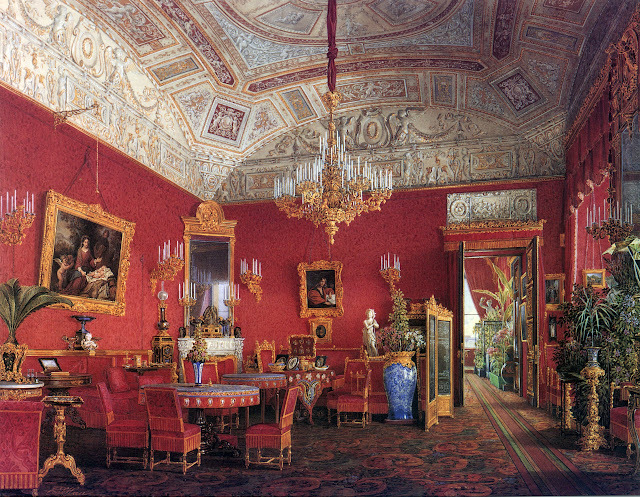 The private entrance was quite an austere and masculine room, and yet the chandelier (an oil or gas lamp?) 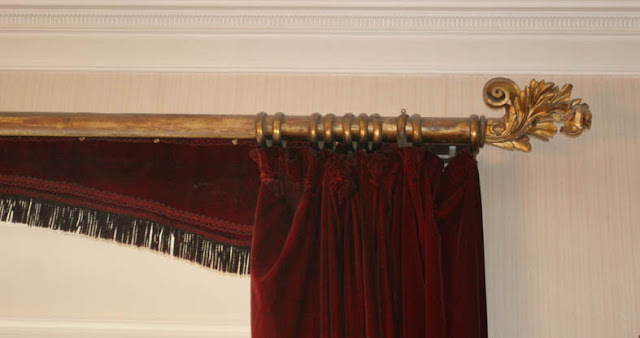 is hung from a fabric sock, matching the red of the carpet. 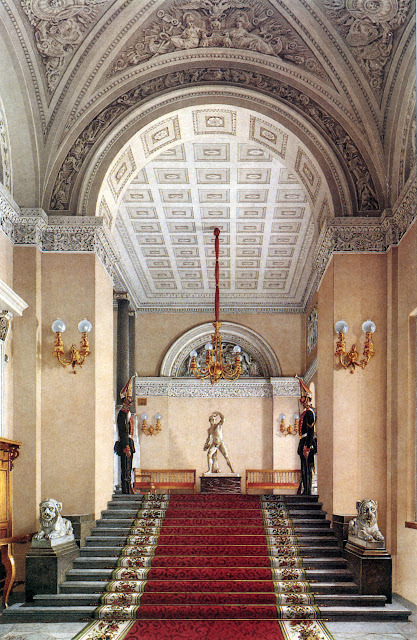 I end with a couple of these fantastic interior views of the Winter Palace. Many rooms had chandelier socks. 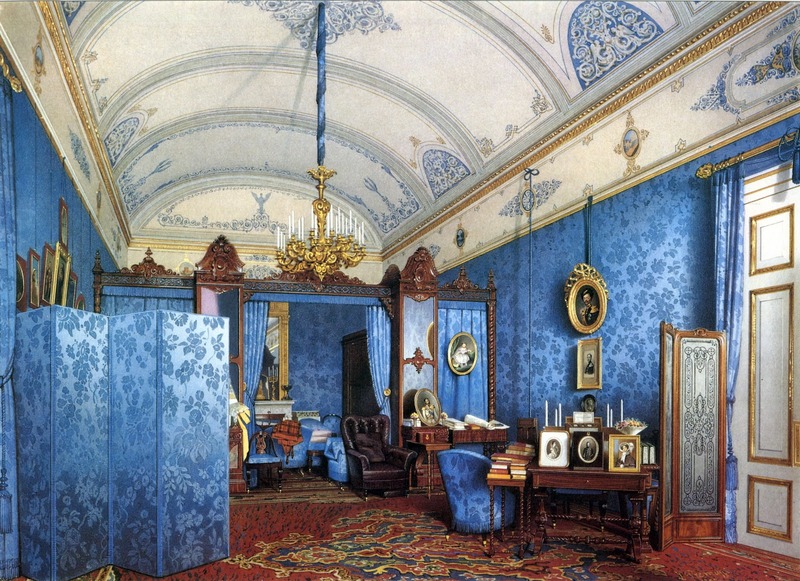 Here is the Dressing Room of Empress Maria Alexandrovna from the 1840s. 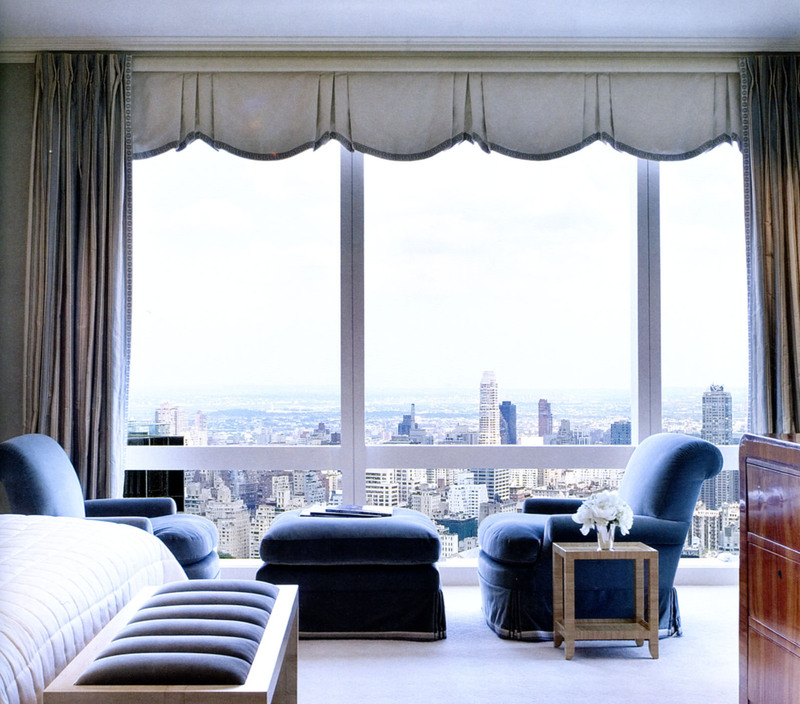 Both this, and the view of here bedroom, show chandelier sock of quite unusual design. The Large Drawing Room of Empress Alexandra Feodorovna, in 1858, had one in red. 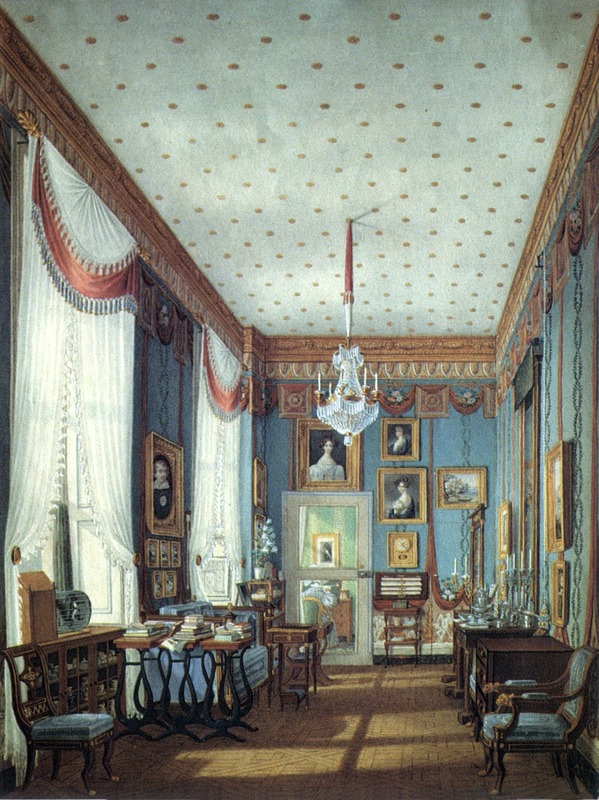 The Small Cabinet of Grand Duchess Maria Nikolaievna, in 1868, had one in green. 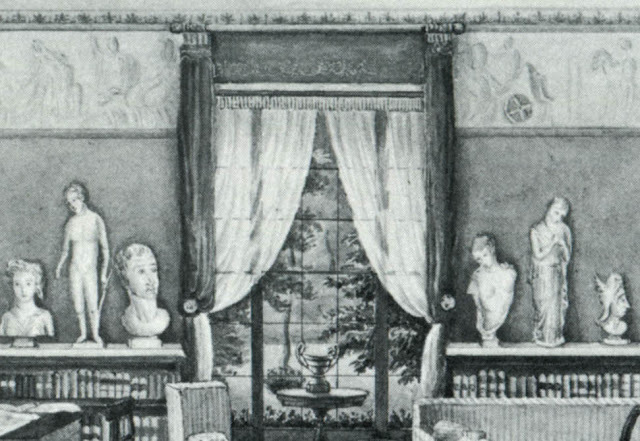 And the Stroganoffs, down the road, even had them in 1865, in what I presume is chintz. Today's roller blinds come in all sorts of colours, fabrics, stripes and patterns and this to my mind is a big improvement over all the plain beige and cream ones that most of us grew up with. I recently came across this photo of the treatment that a creative person had given to an off-the-shelf roller blind from Ikea. I think this is a charming, simple and effective and it made me think of several bespoke 'painted' blinds that I have come across during my imaginary travels through historic rooms. There are not many of them, so I can show them all here, hoping that some readers may be inspired to paint or design something similar. 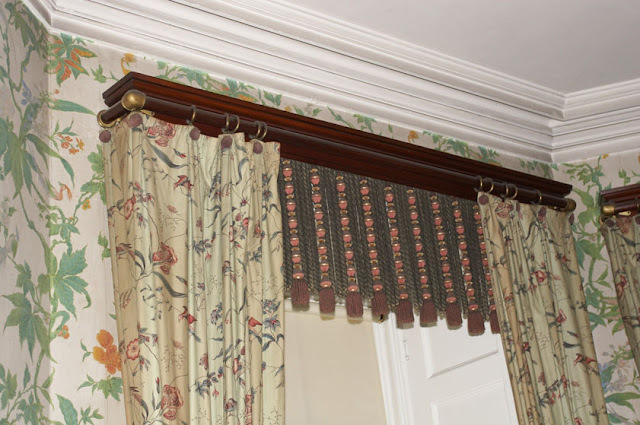 I'm pleased I have persuaded one client to go this way; in a dining room where the curtains won't always be drawn at night, roller blinds with painted decoration can be elegant and fun, and give as much privacy as curtains would. 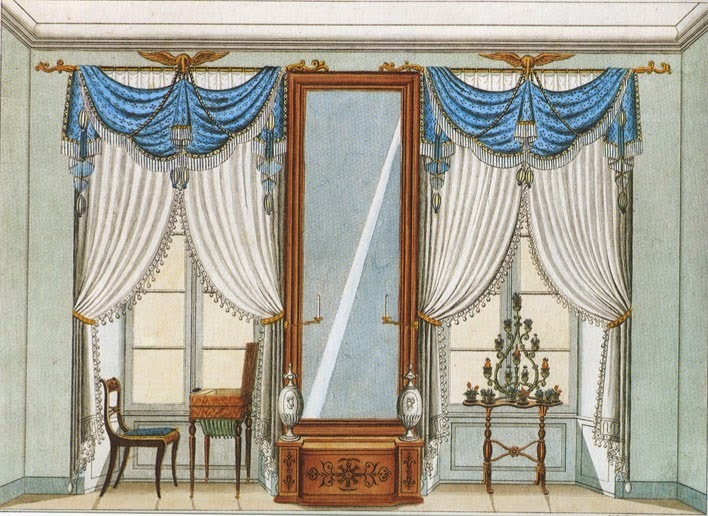 As far as these images show, painted blinds were particularly popular in Germany. 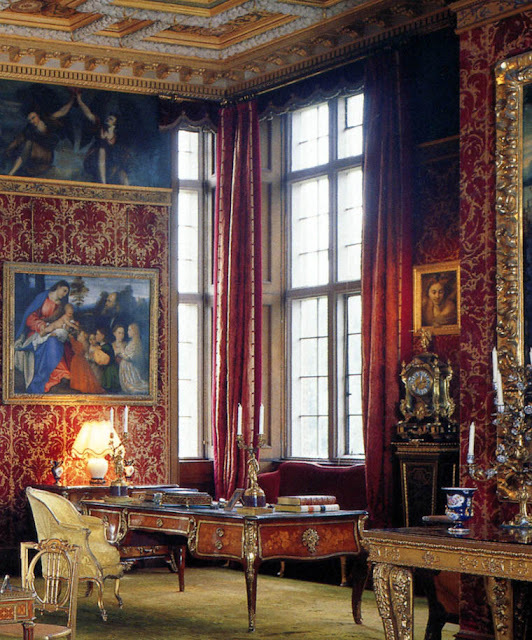 It is remarkable that all of them depict private spaces that are situated inside mostly royal palaces. date from the first half of the 19th century, but then that was also the height of the art of the interior watercolour, which was particularly taken up in that country, so whether these blinds existed in southern countries I couldn't say. 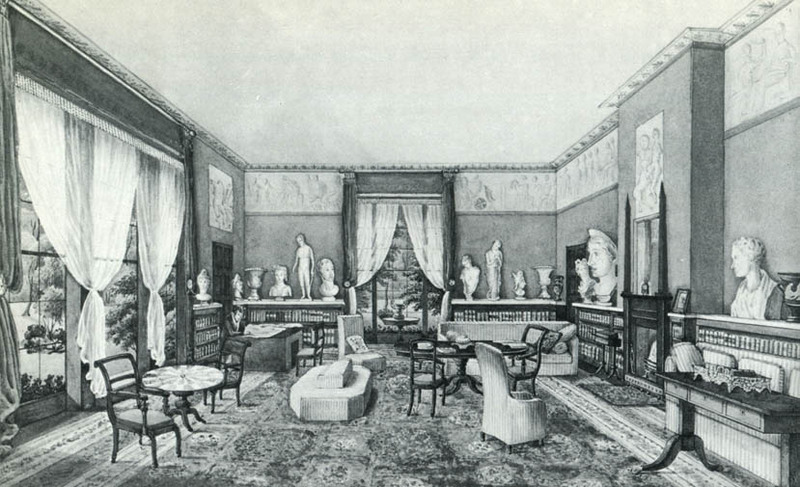 The earliest image I have found dates from 1829. 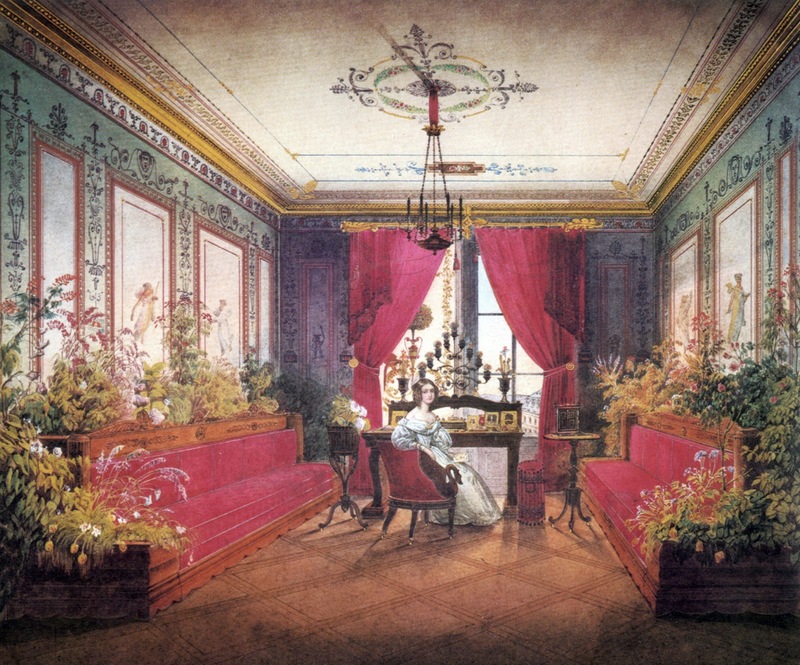 Princess Augusta's 'Muslin Closet' in a Berlin town palace decorated by the then uber fashionable Schinckel was entirely hung with muslin drapes with decorated borders. 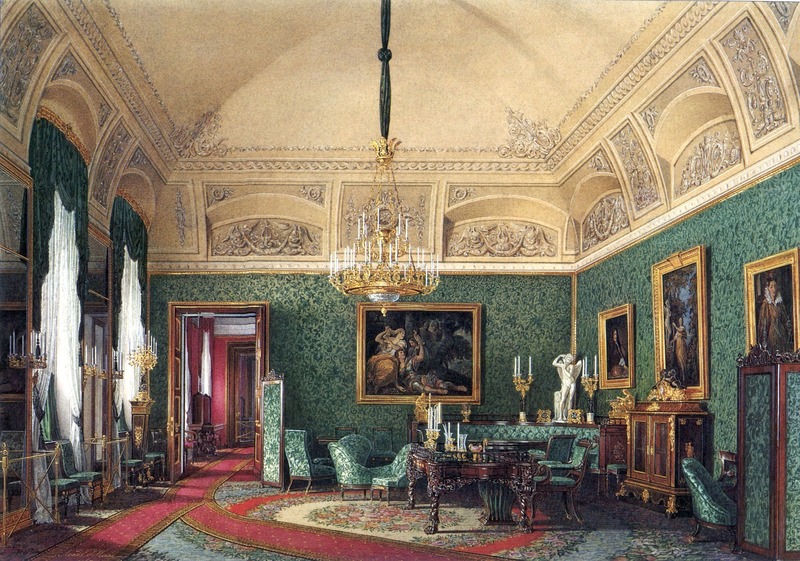 Another private sitting room, this time in the Palace of Bamberg, is depicted in this gorgeous watercolour of 1844. 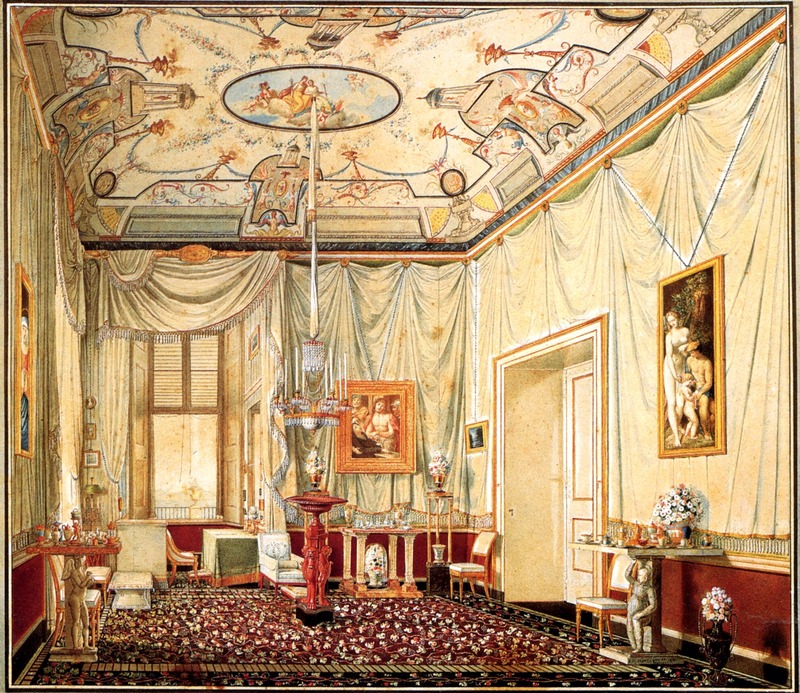 The decoration is in a Roman/Etruscan style, and this particular Princess took the floral arrangements to an altogether higher level. 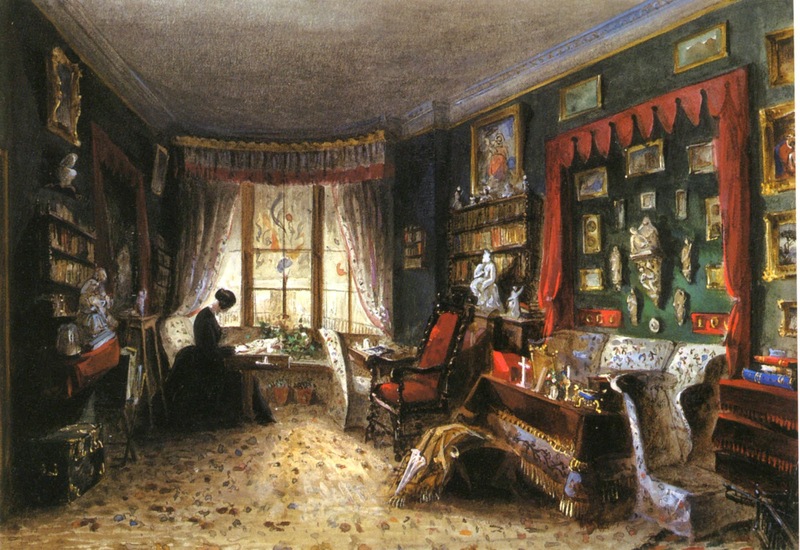 The view through the window suggests an upper floor of the palace, so one can sympathize with this young lady's desire to bring so much greenery into her room; the gardens must have been a long walk away! Another one of my favourite images dates from the 1830s and shows a private sitting room in the Royal Palace in Berlin. 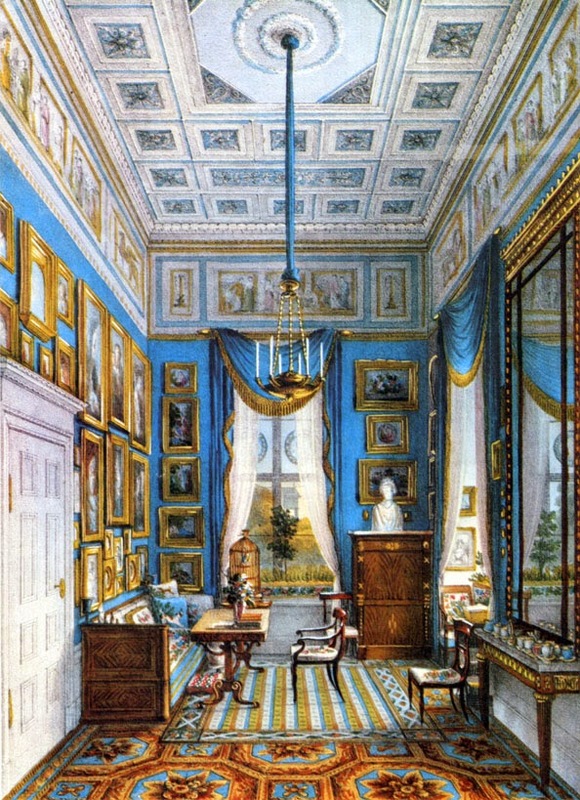 I love the blue and gold in this room, which must have been in an important part of the palace, judging from the decoration and the height of the ceiling. The picture hang is also quite grand, but the room is furnished as a private domain; with a sofa, a reading table, a couple of light chairs, and a charming seating area inside the window. There is also a small, personal rug under the table, protecting the grand carpet. 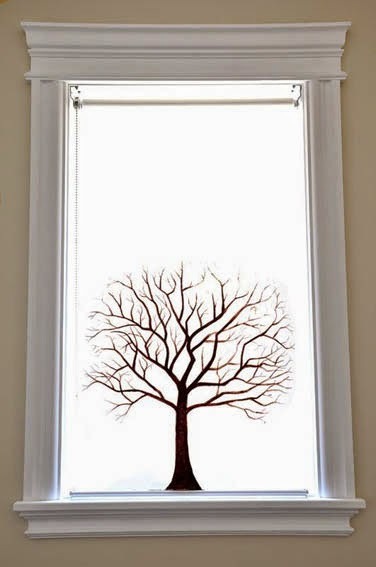 Now ... is this a plant on the window sill - or a landscape with a tree painted on a semi-transparent blind ? It looks even more like a painted tree reflected in the big mirror. 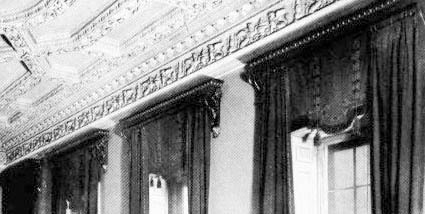 It appears that through the blind one can spot a pediment on columns of a nearby building. It must have been painted on something like muslin, which presumably doesn't roll up easily like paper or canvas. The user of this room will have had servants to attach and remove the blind, so I guess practicality was not of prime importance. 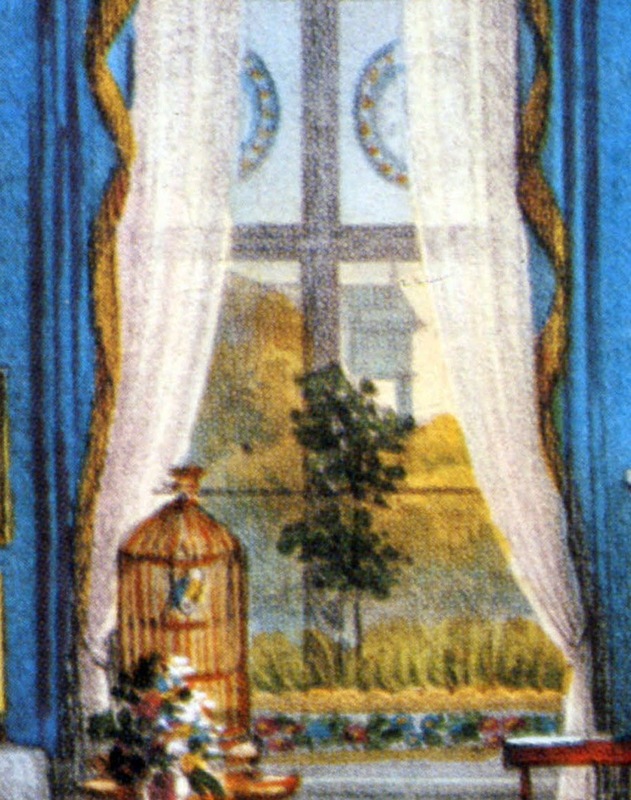 The next example is also semi-transparent and was published in a French magazine in 1840 and may there for not depict an actual room. 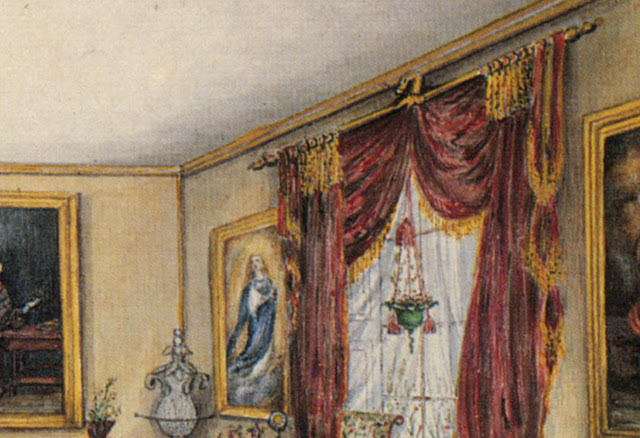 Even so, the half drawn up blind painted with a Chinoiserie scene looks charming. 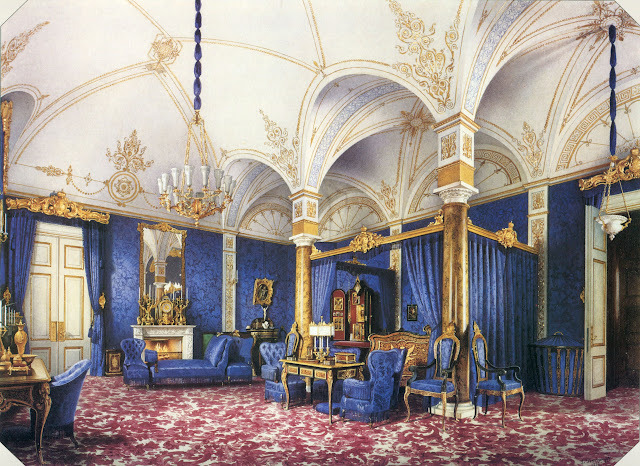 An equally elaborate design was present in another private study in an apparently royal castle in Silesia, around 1850. 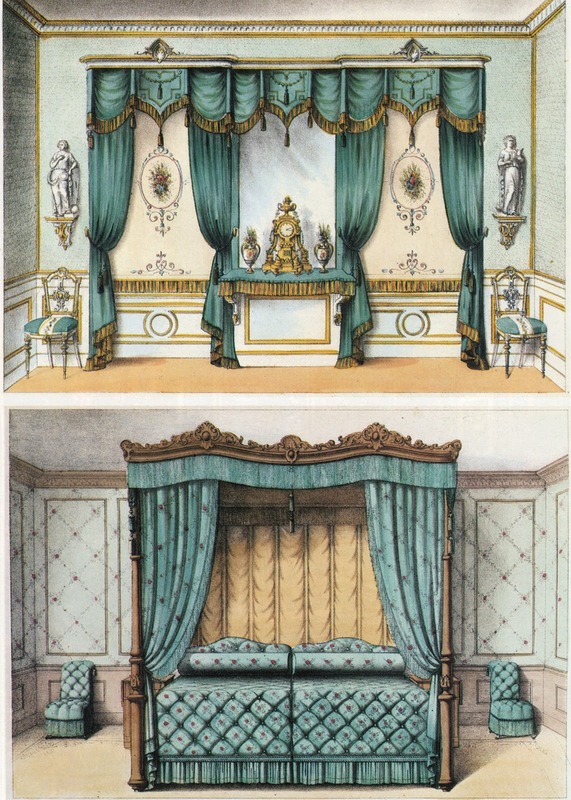 The windows have smart, embroidered surrounds (of which the proper name escapes me right now ....) and seem to lack draw curtains. Instead, there are blinds painted with a fantasy river landscape. This must have been in summer, and I love the row of miniature plant pots on the window sill. So far these are all blinds that show their best effect when they are fully drawn down. 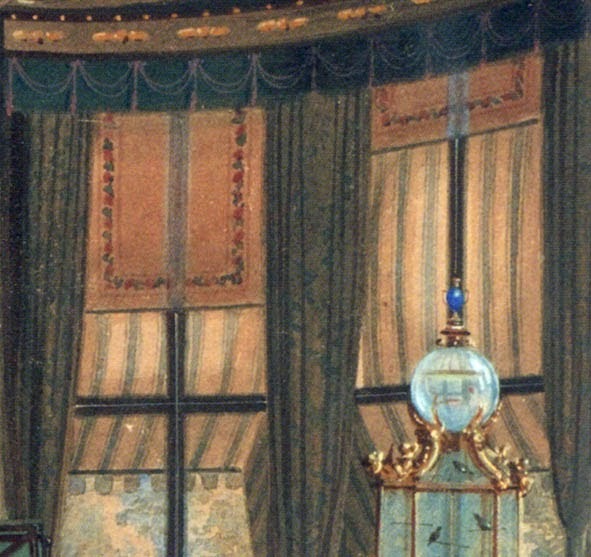 They are painted landscapes or decorations that perhaps looked a bit odd when the upper part was invisible and the design would start half way the window. 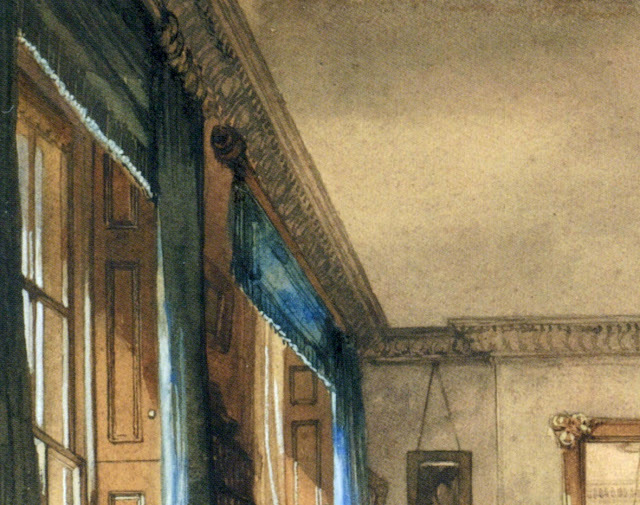 Blinds that solve that problem would need to be of a much simpler design and the earliest of those I have found in a charming watercolour of a very private sitting room at Buckingham Palace. 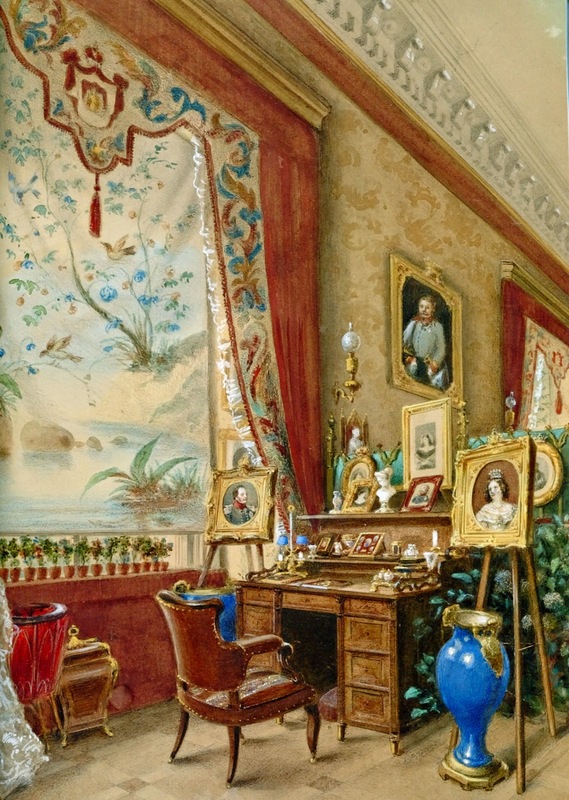 Here, Queen Victoria's family enjoyed views over the gardens and the afternoon sun. There were striped awnings outside and painted blinds on the inside. They had a border of (presumably) flowers in between two thin lines; a design that worked regardless of high or low the blinds were drawn. 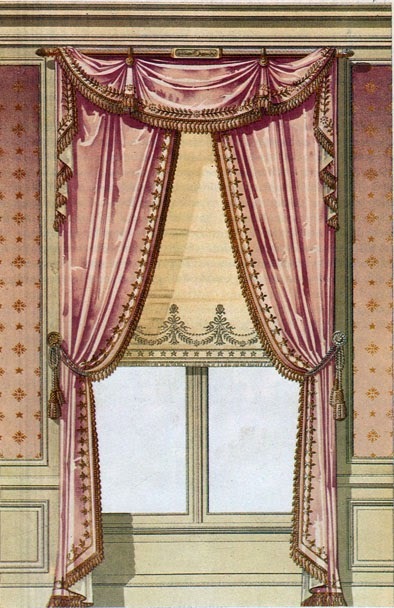 The same was true for this curtain and blind design that was published in 1900. Here too, the design always works, as it's really only a wide border along the bottom. This kind of decoration is not difficult to do and could be easily painted or stencilled on a roller blind today. And finally an actual painted blind that I was very happy to spot in an auction catalogue. Somehow this reminds me of rooms in Italy or Spain - backgrounds in films like The Leopard and other gloomy, dusty rooms. For a study I think this would look very smart indeed. I have no idea really how widely used blinds like these were; among thousands of images I have only found these few. Painting this kind of interior views was not as widespread in southern countries as it was in the North, so there is very little evidence for their use in countries like Italy or Spain. On top of that, due to their material and their use, very few of them will have survived the ages. Sad, because I really like them ! 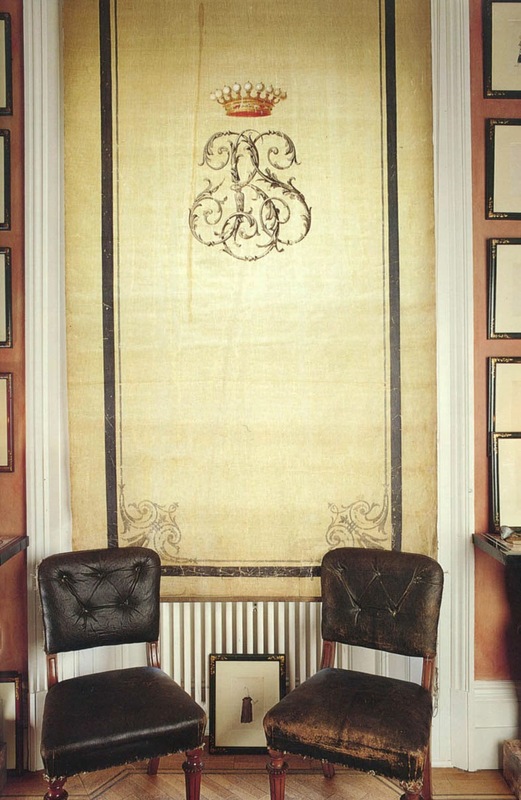 As a result of this post, I was sent two photos by a reader, Penelope Bianchi, of paper blinds that she found many years ago in an Antique shop in Florence, and which have clearly found a very sympathetic home in California. Thank you Penelope! 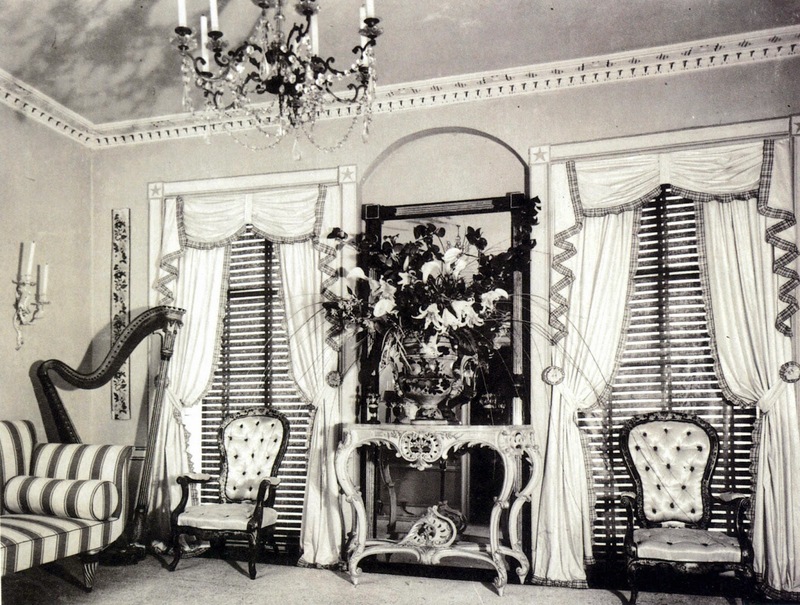 In her message she says that there were blinds like this in the Madelaine Castaing sale, but I never saw the catalogue. I would love to receive photos and add them to this little collection. Any one? I am unclear as to where the original idea came from, but John Fowler used it a lot, and as a result it has never really left the scene. 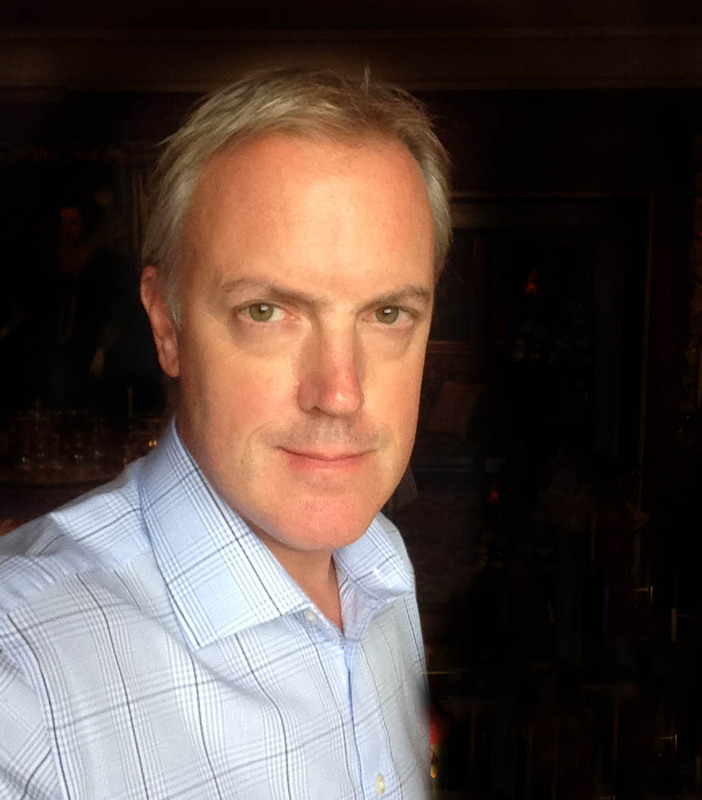 It has been widely mentioned in blogs, like here, here and here. 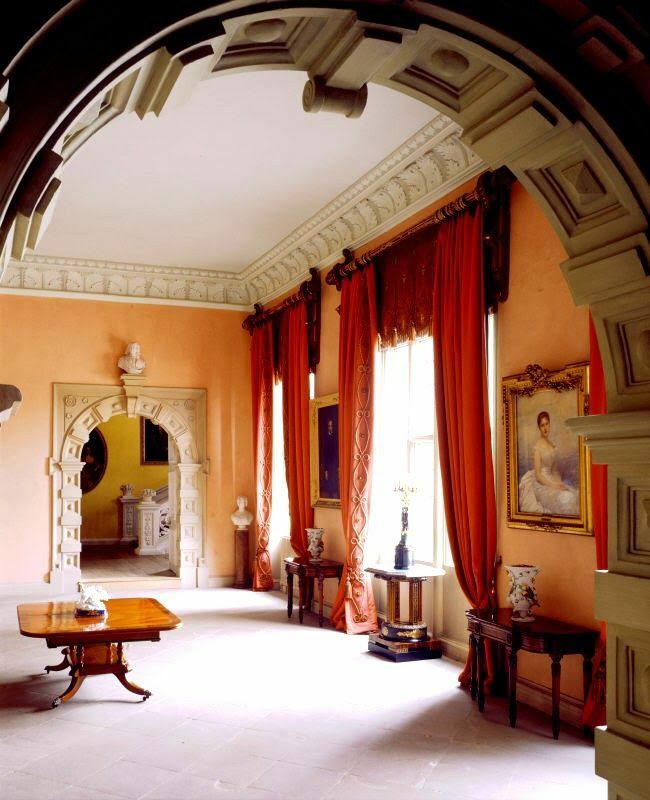 At the moment it is available from Nicky Haslam, who himself is closely linked to John Fowler, as he uses the latters home as his country retreat. 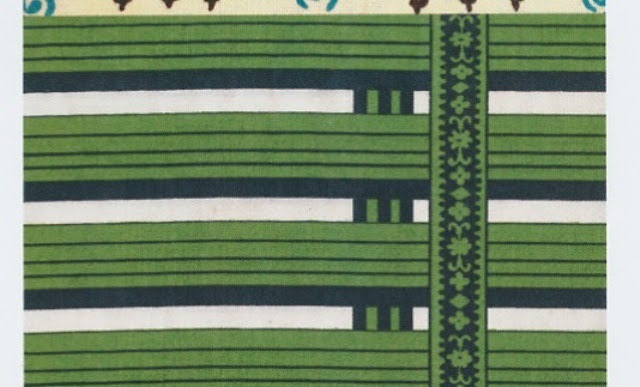 The fabric is called Shutter Stripe. 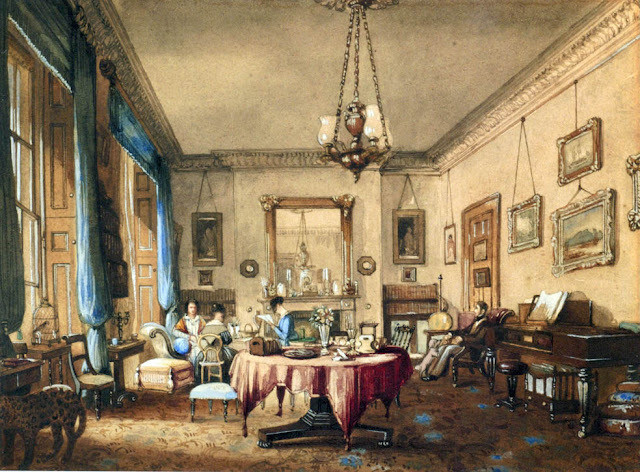 John Fowler used it in his sitting room, which lends it a strangely Southern State American atmosphere, although the busy King's Road must have been very audible in this room. 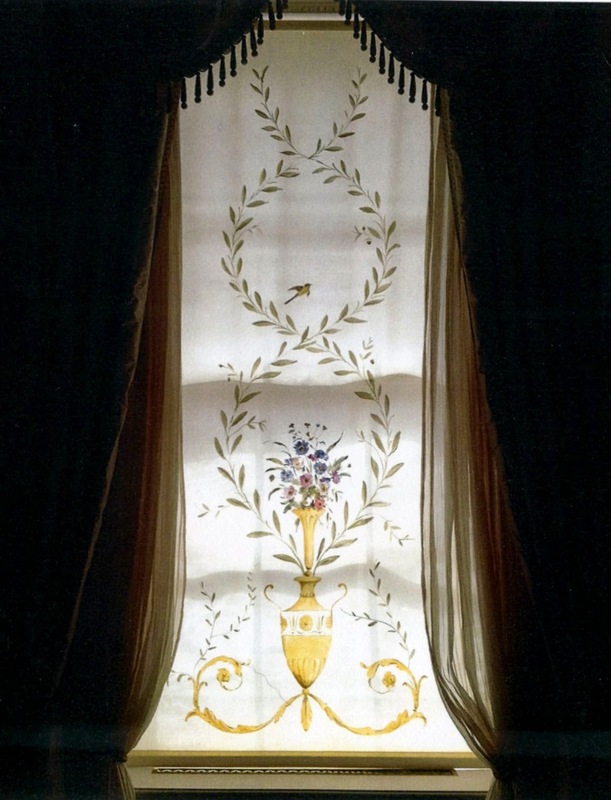 As I am making a little collection of painted blinds here on my blog, I will add a photograph that I was given last week of a blind that my friend Michael Dillon painted for a project designed by Caroline Percy. I think it is beautifully elegant, very effective and I hope it will inspire my readers. Many of the images came from that invaluable book AUTHENTIC DECOR, by Peter Thornton.